Here's a picture of my parents from some period in the 70's. My dad passed away in mid-January of this year at age 89. 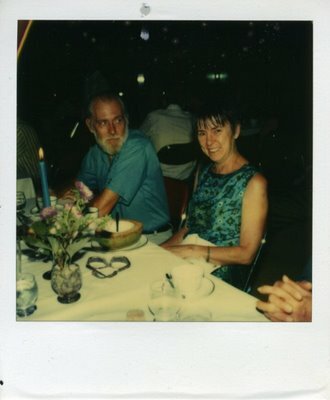 Dad was devoted to mom and us kids, but he also loved his grandkids, traveling, other cultures, and woodworking. Besides leaving a collection of fine handmade furniture and turned wood pieces, he leaves a hole which cannot be filled but can be honored and remembered. I've been cocooning myself the past couple months, as reflected in the absence of new posts on this blog. As spring gathers momentum my enthusiasm for painting is returning. So, in light of this I offer the following painting, one which I'm sure my dad would have liked for its peaceful and rustic subject. 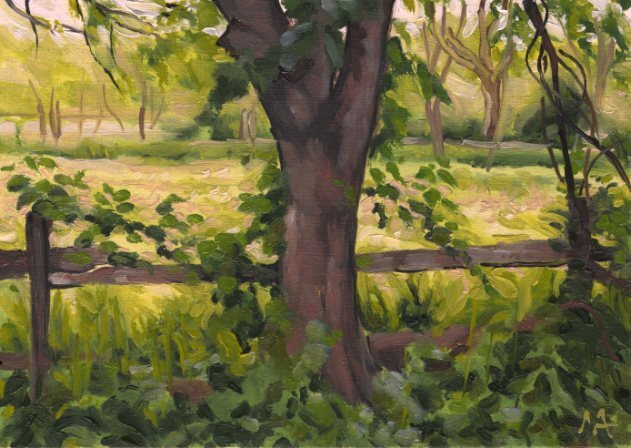 This tree and fence live in Old Bethpage Village, a county cultural site here on Long Island, New York. Kay and I like going there because it is an antidote to the frenzied car and shopping culture of Long Island. Old Bethpage Village is a historical restoration of 18th and 19th Long Island architecture and culture. It feels like an oasis.